Well it only took the entire month of August, but the Mets finally won a big series against a playoff contender. My mind is blown. My socks have been knocked off. And how did it happen? 34th-round pick Seth Lugo gave the Mets a clutch start, and Alejandro De Aza (starting for the injured Jay Bruce) drove in 5 runs against Adam Wainwright including a three-run homer. Unbelievable. The Mets are 3.5 games back in the Wild Card race. Now we start a homestand against the Phillies and Marlins. I feel rejuvenated. Honestly, by the end of the fifth inning my 2016 season optimism meter was skyrocketing. The opto-meter needle was at it’s highest level since May. And then Seth Lugo was METS-bitten and came out of the game in the 6th inning with another calf cramp injury. It was a feel good game. Then I went to the bathroom, and by the time I came back Lugo was gone and the good feelings started to evaporate. After Lugo was yanked the bullpen gave up 6 runs, but luckily the Mets held on for the win. De Aza Catch: From the start De Aza was shining. The first ball of the game was rocked by Matt Carpenter and De Aza made a leaping catch at the wall. He took away a double. My main man Alejandro. Wilmer Sac Fly: In the second inning, James Loney singled (one of 3 hits in the game) and Curtis Granderson doubled. Then Wilmer Flores managed to hit a sac fly off of Adam Wainwright to give the Mets a 1-0 lead. The De Aza Game? : In the fourth inning, Curtis Granderson reached on a fielding error and Wilmer Flores hit a double. With two runners in scoring position and nobody out Alejandro De Aza hit a clutch single to center field to drive in 2 runs and make it 3-0 Mets. A clutch hit with runners in scoring position? Alejandro De Aza did something? Hell yes! The Challenge: In the fifth inning Yoenis Cespedes walked. Then James Loney hit a bloop single to left field, and Yo hustled to take third base. The play at third was challenged because the tag by Wainwright seemed on point. But upon replay review it was clear that Wainwright’s glove came off when Yo simultaneously stepped on the bag and Waino’s glove. The glove came clean off of his hand and the tag was ruled invalid. It was an absurd play. With first and third and one out Grandy struck out in pathetic fashion. Then Wilmer Flores hit one up the middle and the shortstop booted the ball. Yo scored on a gift error. The baseball gods finally gave the Mets a break. The De Aza Game: Right after the run scoring error, Alejandro De Aza came up and launched a three-run homer to make it 7-0 Mets. His 5th RBI of the game. 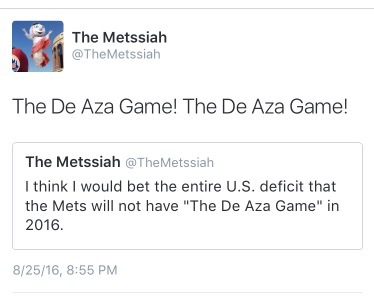 A month ago I said we’d never see the day when De Aza was a hero. Well this was his day. Lugo Dunzo: Seth Lugo pitched 5 scoreless innings and gave up 2 hits. Then he came out of the game as he fell victim to the great calf epidemic of 2016. Jim Henderson came in and promptly gave up a two-run homer to Brandon Moss to make it 7-2. Decapitated: In the 7th inning Jerry Blevins was almost killed by a comebacker hit by Matt Carpenter. It just missed hitting Blevins’ face/pitching hand. That’s just noteworthy because of our injury epidemic, and also because Blevins missed all of last season due to a comebacker off of his pitching arm. The guy is a baseball magnet. But Jerry retired the side in the 7th. We Barely Finished: In the 8th inning the Mets loaded the bases with one out but only managed to add one more run. Asdrubal Cabrera hit an RBI single to make it 8-2 but Yo hit into a double play with the bases loaded to end the inning. In the 8th inning Brandon Moss hit another solo homer and then the Cards scored another run off of Josh Smoker after an error and a bunch of soft cheap hits. But the Mets escaped the inning with the score 8-4. Then in the 9th inning Loney and Flores singled, and Rene Rivera put the final dagger in the Cards heart with a single of his own. He drove in 2 more runs to make it 10-4. Jedd Gyorko and Stephen Piscotty added solo homers off of Sean Gilmartin in the 9th, but Sean managed to close it out. 10-6 was the final score. Classic Mets: I must say that the Mets offense has started to mash again at literally the exact same moment that every single pitcher in the organization has burnt out. No lead was safe tonight with this pitching staff. The timing of the offense/pitching Freaky Friday flip-flop is completely ridiculous. Classic Mets. Met Killers: Yadier Molina added another hit against the Mets tonight before he was pulled from the game once the Mets established a 7 run lead. The Cardinals tweeted that he’s hitting .579 against the Mets this season. What a goddamn Met killer. Speaking of Met killers, Carlos Ruiz was traded by Philly to the Dodgers. At least we won’t have to face him this weekend! Speaking of .500: Speaking of dudes batting .500, Michael Conforto is literally hitting over .500 in Vegas. Grandy hasn’t done anything to deserve playing time right now. Conforto should be up here and playing the outfield ASAP. Seriously: I was reminded today that Kyle Hendricks on the Cubs leads the NL in ERA. First Jake Arrieta emerges as a star and now Kyle Hendricks? Now the Cubs have the elite young pitching and hitting? What the hell do the Mets have? And why can’t we have some guy magically emerge as a stud? I want one of those out of nowhere success stories for the Mets. Tomorrow: It’s really simple people. If we want to win the Wild Card then we need to make up ground. Sweep the Phillies at home. It’s time to streak.